Powdered: Garlic, Black Pepper, Cumin, Sea Salt and tiniest bit of Cayenne. Put coconut oil in the skillet or cast iron pan. Set at medium to high heat. As soon as the oil is melted and nice and hot throw bag of green beans on top. If there is not enough oil to “cover” the bottom of the pan add more. Don’t be afraid of the oil! Just keep reminding yourself that this is one of the good guys. 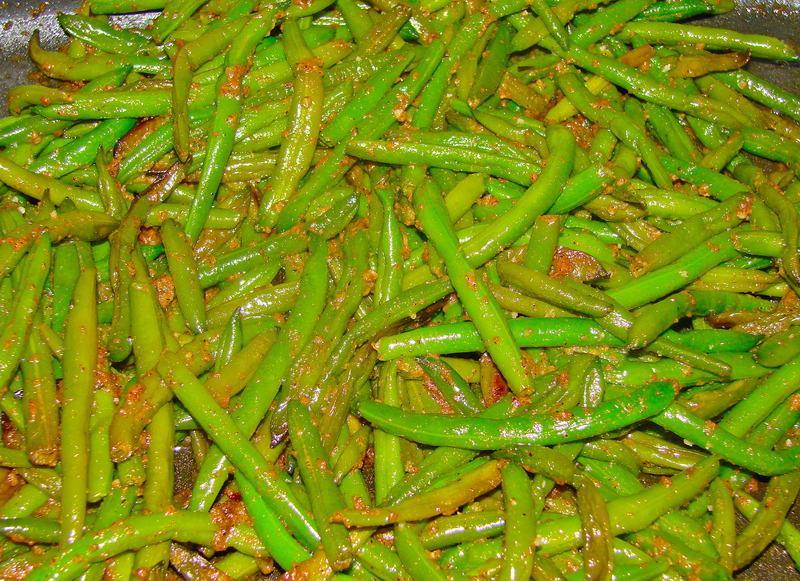 Do not stir the green beans for several minutes after you toss them into the oil. While the bottom layer is sizzling and getting a nice light brown “sear” begin to liberally sprinkle Garlic Powder, Black Pepper and Cumin. I really have zero clue as to amounts on these because I’ve never measured. I can tell you that by the time you are through you will want them literally “crusted” with spices. I generally do a LOT of garlic, followed by not quite as much black pepper (but still more than you might think is necessary) and last but not least a generous dusting of Cumin in not quite as much quantities as the first two. By the time you get the first three lavished upon the green beans it’s probably time to stir them and basically flip the still frozen “top” ones down to the hot oil at the bottom of the pan. Sprinkle more seasonings if it looks like there was not enough on the top layer to go around. At this point I begin sprinkling sea salt to taste. Don’t be afraid to leave the green beans against the hottest part of the pan long enough to get a nice browning effect, it’s part of what makes these so delicious. At the end, after you have taste tested that there are sufficient flavors present and accounted for, and an adequate amount of sea salt gently sprinkle the tiniest amount of cayenne over the whole dish. Flip the beans around and allow a few more minutes on the heat so the cayenne flavor can get thoroughly distributed and meld with the other flavors. The key with the cayenne is to get such a small amount that nobody can really tell exactly what the flavor is and it not be too hot to burn the tongues of the “mild” Peeps. If a super heat sensitivity is present the cayenne can be replaced with mild chili powder (in quantities greater than the cayenne in order to be noticeable at all) although the flavor isn’t nearly as good or as complex. Part of the goal of this dish is to have some green beans still crunchy and fresh tasting on the inside and others to be over cooked and super soft and have a caramelized flavor from the heat. This is a rather fast dish to prepare and should take no longer than 15 minutes from start to finish. I love your green beans and thanks for refreshing my memory. Sounds like you have perfected the recipe. I slip back into the southern traditional preparation without thinking. The steps you take seem to caramelize the beans natural sugars while searing. I haven’t added the cayenne yet but I now love the cumin flavor.